REQUIRES 42 CFM @ 90 PSI FOR PROPER OPERATION. MUST USE CART SUPPLIED FOR PROPER LUBRICATION AND AIR REGULATION. 3" CHUCK ADAPTERS WITH 2" TO 2-3/4" CHANNEL POST CHUCK. 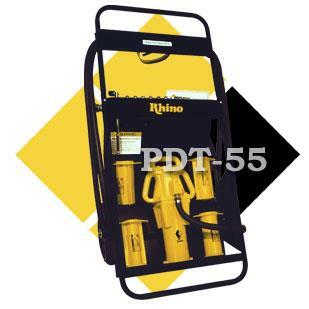 * Please call us with any questions about our post driver rhino pneumatic rentals in Old Town ME, Milford, Bangor, Pea Cove, Eddington, Bradley, Orono, Bangor ME.